What if 68% of your site visitors only came to research an offline purchase? Like the 4 buying modalities, a customer may be generally a ROPO (prefers to research online and purchase offline most of the time), or more likely to ROPO based on the purchase situation (e.g. received gift card from Target for Christmas, hate wandering the aisles on a busy Saturday – research online, walk in, walk out). This offers a higher level of customer service to ROPOs than just providing store lookup on the product page — the ROPO can scan search results and only view details on items they can pick up in-store. 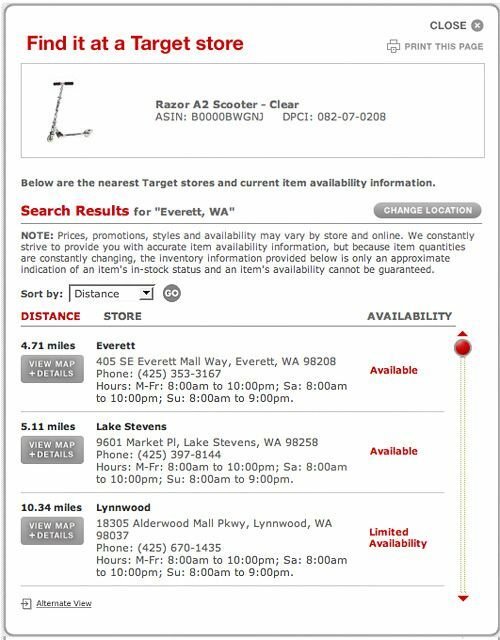 Target shows you locations, hours of operation and a telephone number, sort by distance (not sure how helpful this is if you don’t live at the center-point) and low or normal availability. You can also view a map and print the page in regular or map view. To make this even more helpful, I’d like to see is a zipcode or city-based filter where you could define your location, and see only products available in-store locally. I’d also like to see a button or icon that differs from the add to cart button (to facilitate scanning if you don’t use a filter) – change the size, color and shape. Another idea to help ROPO is to use geoIP detection to sniff out visitors from areas you have a local presence. 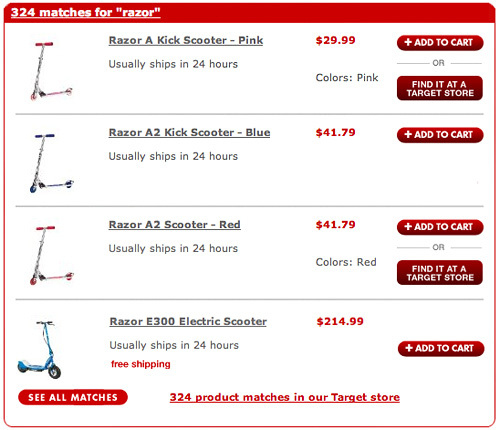 Show these visitors custom content throughout the site with a link to your store locator or inventory lookup. Have you seen any other e-tailer examples of how to aid ROPOs? Previous articleShould You Have a Mobile Version of Your Ecommerce Website?